Related applications for this technology include degassing, desulphurization and decarburizing. Metallurgical treatment combines flux injection with gaseous diffusion and is supported by plc controlled and repeatable variable flame chemistry. Utilising established Monometer rotary furnace operating parameters and design, the Monometer refining technology integrates seamlessly with existing processes of smelting, refining and alloying. With optional retro-integration, foundries achieve with lower grade charge materials the higher purities and specifications of product typically associated with more costly feed materials. Monometer rotary furnace technology extends to smelting the typical foundry dross and oxide wastes formed during normal furnace operations. Each of smelting, refining and alloying is carried out in a single furnace system for a range of metal specifications while avoiding carryover contamination between cycles. For example, Monometer’s recent installation in the Chelyabinsk region of Russia enabled the production of copper granules from Birch/Cliff scrap to a suitable specification for the ultimate production of copper sulphate for the food industry. Monometer supplied the turnkey installation including the furnace system, charger, flux injector, refining injection technology and bag house filter system. The Monometer furnace system is typically supplied with a 4.5 to 6 tonne capacity Monometer rotary tilting furnace, although furnaces with bath capacities up to 10 m3 are available as standard. All furnace sizes are suitable for higher temperature processes, such as the treatment of copper concentrate, sponge iron and metallurgical adjustment of cast irons, or may be applied to applications such as degassing of aluminium, by the diffusion of argon or nitrogen, and targeted element removal such for sulphur and carbon. Heavy metals such as nickel require cycles of selective flux treatment in the process of oxidation followed by reduction. Other components of the plant may include the Monometer low dust and low noise rotary charger, porous gas diffusion technology, oxy-fuel burner system, exhaust filter for all particulates and fines including hooding, settler, bag filter, the fluxing agents injector, and consumable spare parts. 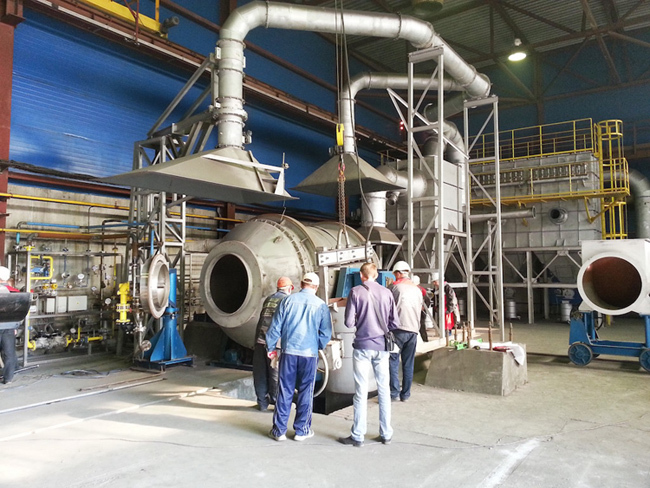 Monometer continues to develop rotary furnace technology to increase flexibility and thermal efficiency. As part of this programme fully regenerative burner systems suitable for a range of medium temperature processes are now supplied in areas where oxygen is either relatively expensive or practically unavailable. Regenerative burners offer energy efficiency and reduced cycle times approaching the performance of oxy-fuel melting, without consuming bought in oxygen. Monometer’s lower cost options for burner technology include low nox systems operating with high efficiency multi-pass tubular recuperators, and a range of low and medium pressure burners. All Monometer burners are designed to operate with most liquid fuels including standard furnace and diesel oils, reclaimed oils, coal tar fuels and many bio fuels. Monometer has experience in handling and producing Russian compliant import documentation including GOST certification.